What are the things that make you happy? Wherever you are right now, whatever you’re doing – stop and think about that for a minute or so. Come up with 5 things in the last day or week that have brought you joy. It can be anything, big or small, that made you feel truly happy – a kind smile from a stranger, a stolen minute of peace and quiet, an embrace with a loved one, or a bowl of (paleo) ice cream. Do you have these things fresh in your mind? How do you feel? In the hustle and bustle of today’s fast paced society, it’s so easy to forget to reflect on these things that bring us joy. But it’s amazing what a moment (or two) of reflection can do for our mood and quality of life! I’ve made it a personal goal to reflect on the things that I’m happy about, the things that bring me joy, and the things that that I’m appreciative for every single day. I’ve been doing it in the quiet moments before I go to sleep or as I wake up, and it helps keep me grounded. Happiness is different for every person, but I think we all tend to compare ourselves to others at point or another. ‘Well so-and-so does this-or-that and they’re really happy! Maybe I should do that.’ Well, maybe you should, or maybe you shouldn’t. What do YOU want to do? Will this thing, person, activity, make you happy? Discover yourself. Discover the things that fill you with satisfaction. And go do them! The idea of ‘time’ can be a horrible obstacle sometimes. Stop thinking about it every once in awhile, otherwise you’ll never have enough ‘time’ to do anything! Make time for yourself on a daily basis, or share your time with others if that’s what makes you happy. Go outside, read a book, spend time with loved ones, pick up a new hobby take a hike, play hide-and-seek with your kids – find things that fill you up. The quality of your life and your state of mind will drastically improve. 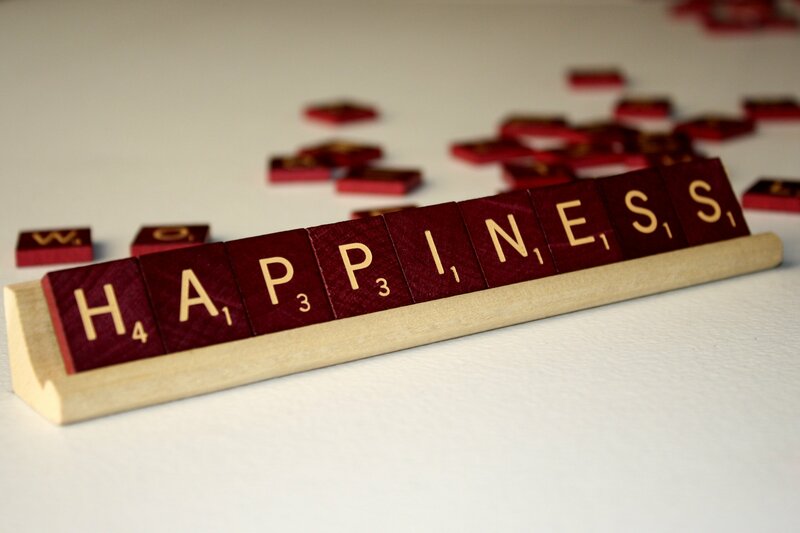 In my efforts to keep my personal goal of reflection going, I’m starting a new weekly post called ‘Happiness Is’. Welcome to the first edition! It’s a small list of things that are currently making me happy; things I’d like to share in the chance it’ll bring someone else happiness as well. Sometimes it’ll be serious, most of the time it will be silly, and food will be involved in every post, guaranteed. 1. 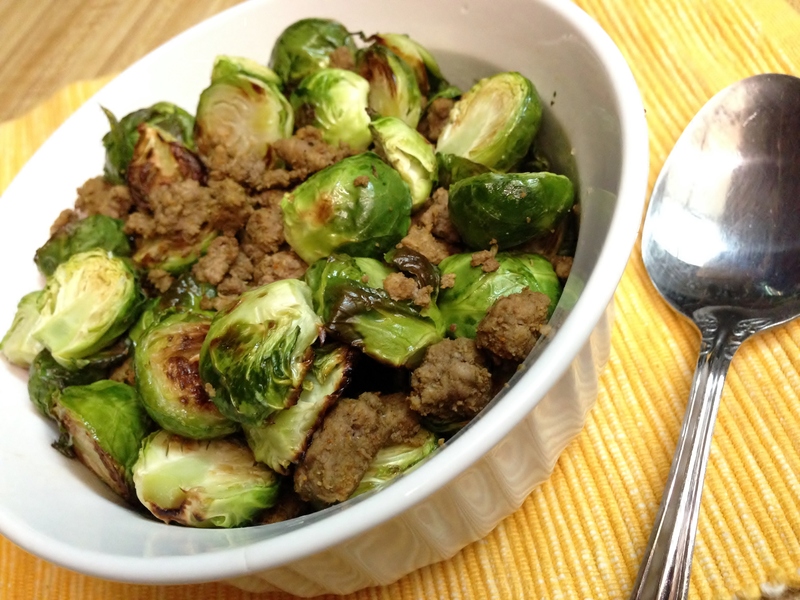 Happiness is…a bowl of brussels sprouts. I told you there would be food involved. I’ve been eating these green balls of amazingness at least 3 times a week lately. If you have some kind of fear of brussels sprouts, which I don’t understand because they are fantastic, try slathering them in coconut oil with salt, garlic powder and pepper and roast them at 375 degrees (F) for 20-25 minutes. OR pan fry them in bacon grease. OMG. You know what, just do it and then come talk to me. You’ll be adding it to your happiness list too. 2. Happiness is…finding the time to study every week. Confession time – I’m a horrible procrastinator. I mean, it’s BAD. I’ve got a problem. Do they have 12 step programs for these types of things? Maybe I should look it up. Anyways, almost every week I find myself struggling to finish homework and studying at the very last second. I become a little ball of stress and frustration, lose sleep, and come to class partly unprepared. But when I make time to study every day, start on things ahead of time, and not let too many distractions get in the way, I feel happy, I’m prepared and I’m not rushing to complete things at the last minute. CRAZY. 3. Happiness is…discovering something that just makes sense. Have you ever had that moment when you find something new and it completely clicks with things that are important in your life? 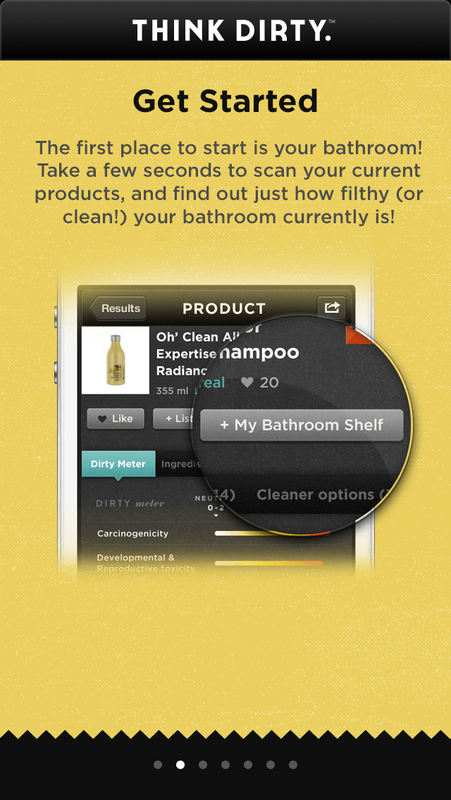 It’s like the angels start singing and you find yourself saying’ hallelujah!’ I had that moment when I found this new app, called Think Dirty. 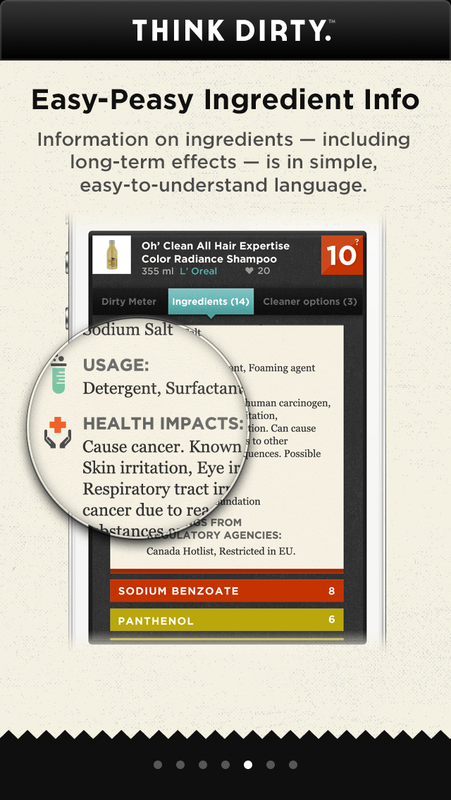 It’s a database of beauty products that lists and measures the toxicity of ingredients, and recommends products with clean ingredients. 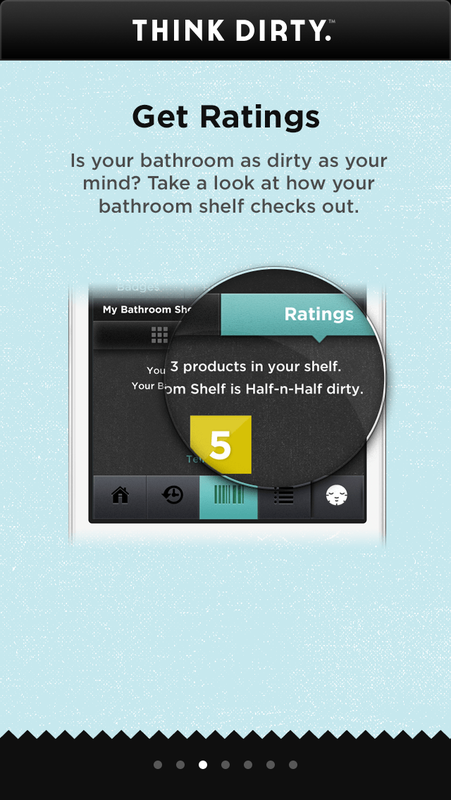 You simply scan the bar code of the product and the app will pull up the results. 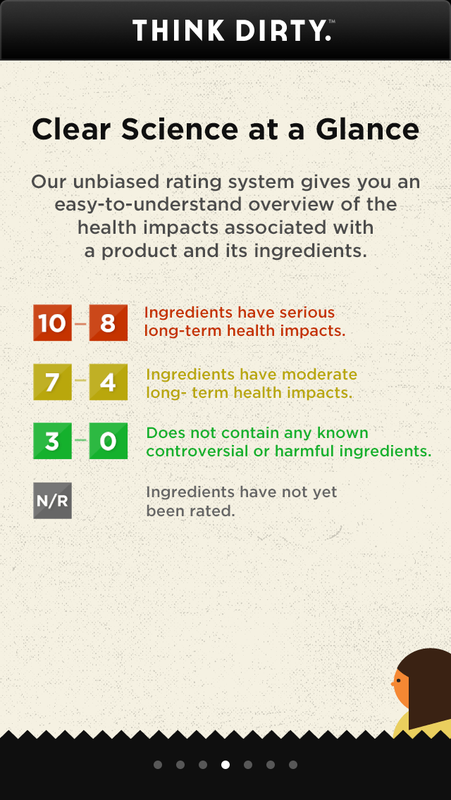 If the product is not found in the database, you can add it by taking a picture of the product and the ingredients list. I LOVE THIS. I went through all my beauty products (even the ones in the back of the drawer that I don’t use anymore, but haven’t thrown out yet. If you’re a woman, you know exactly what I’m taking about) and started scanning EVERYTHING. I was surprised at what I found for some of my ‘cleaner’ products. Please waste your time on this. It’s worth it and it’s fun. 4. Happiness is…listening to my grandmother talk about her life. There are two parts to this one. The unhappy part is that my grandmother was admitted to the hospital for pneumonia last week. She’s doing much better now, and has been moved to the rehabilitation center to gain her strength back. The happy part is that I was able to visit her on her last day in the hospital and we sat and talked for hours. Even under poor circumstances, she is such a happy, positive and wise person. We talked about family, and life and love. We laughed and we cried. It was one of the best Friday nights I’ve had in a really long time. 5. Happiness is…recreating an old favorite treat. Heat the almond milk in a sauce pan or microwave. Yes, I know cave women didn’t use microwaves. 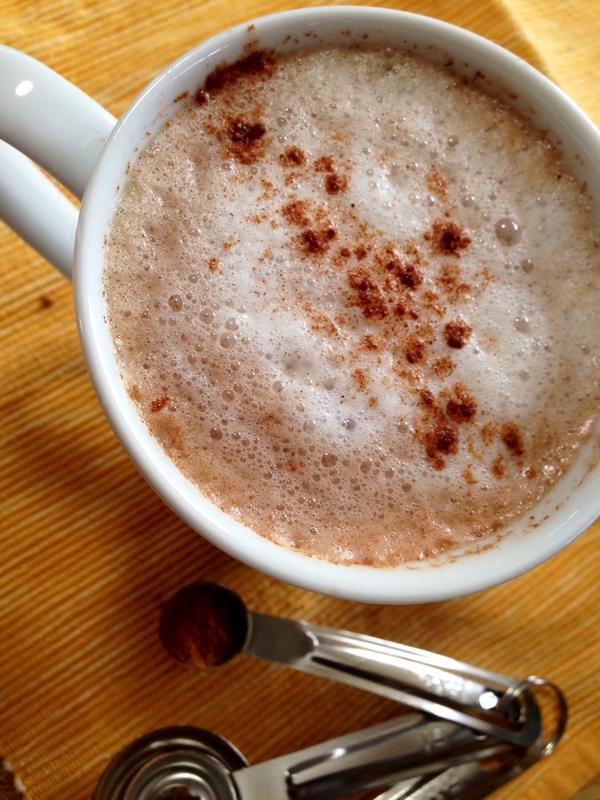 Now that that’s out of the way, stir the cocoa powder, pumpkin pie spice, maple syrup into the heated almond milk. Add the hot coffee and voila! Paleofied fall treat for your morning pleasure. Note: You could also add all the ingredients to blender for a more frothy beverage. There we have it folks! These are my happy things for the week. What are yours? Glad you like the post Leslie! 🙂 Don’t be afraid of the brussels. They are so yummy roasted!